As the second (and some say much less attractive) bridge spanning the East River, the Williamsburg Bridge didn’t score the same adulation as the Brooklyn Bridge did. 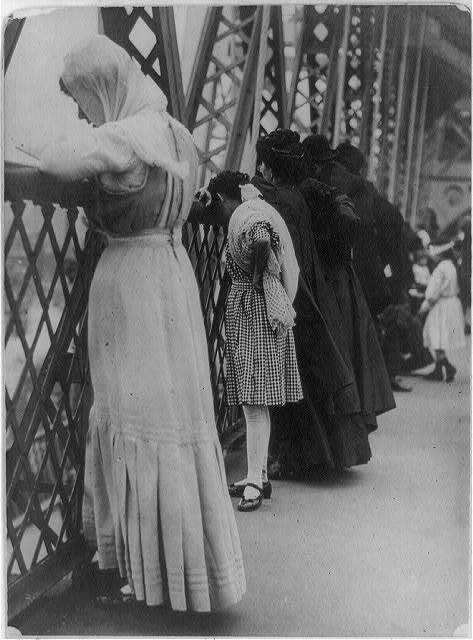 Opened in 1903 and until the 1920s the longest suspension bridge in the world, the humble Williamsburg sparked the migration of thousands of Jewish immigrants from the cramped Lower East Side to slightly more spacious Brooklyn. “In its early years, the walkway, which was wide enough for pushcarts, was so crowded with peddlers transporting their wares to and from Manhattan that one newspaper dubbed it the ‘Jews’ Highway,'” writes Victor Lederer in the Brooklyn Historical Society’s Williamsburg. Watch a fantastic news clip of opening day on the bridge and the top-hatted dignitaries who ceremoniously walked across it first. 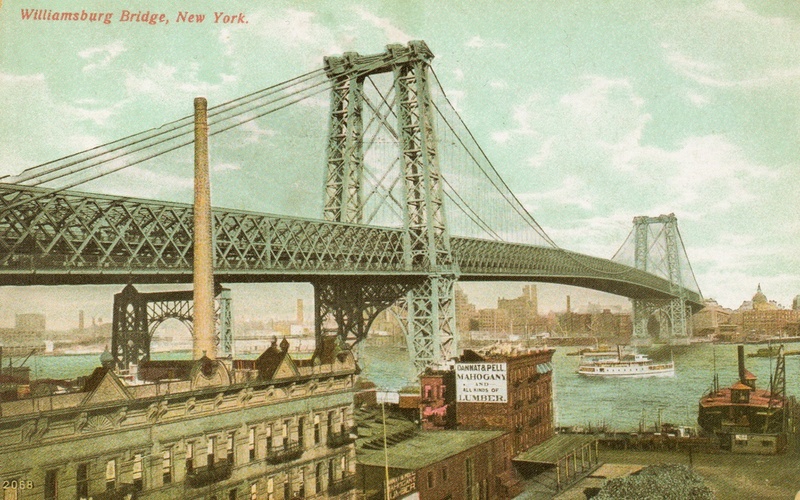 By the time it opened in 1903, the Williamsburg Bridge had its name. 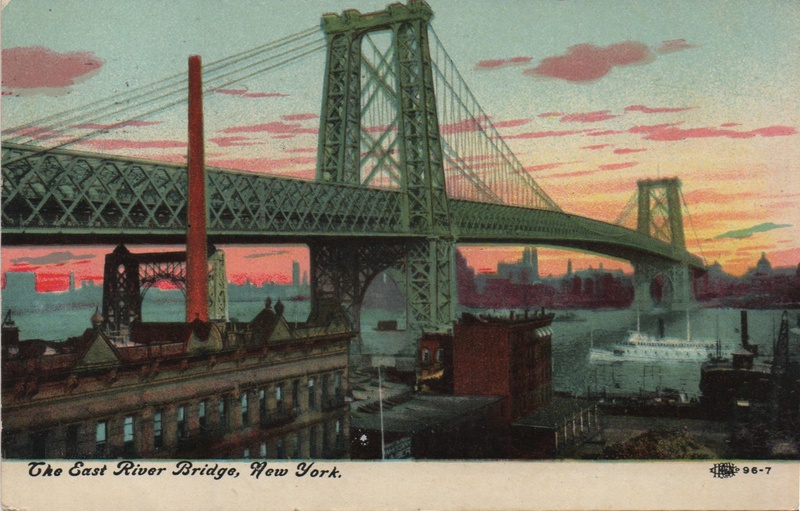 The postcard, stamped 1912, must predate it—hence the East River Bridge moniker. We must be looking toward Brooklyn; that appears to be the domed Williamsburgh Savings Bank building far off in the distance, with a couple of lonely tenements huddled by the waterfront on the Manhattan side. 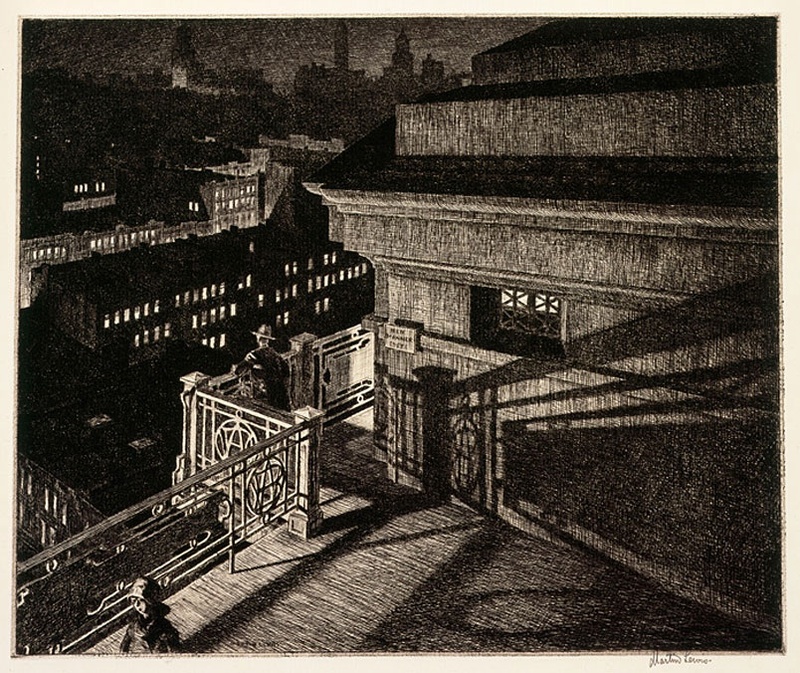 Martin Lewis’ 1928 etching illuminates some of the city’s mysterious layers, levels, and corners. This piece belongs to the Brooklyn Museum . . . which for some reason doesn’t have it on view, according to the website. Memo to New York museum curators: An exhibit of Lewis’ etchings is long overdue! 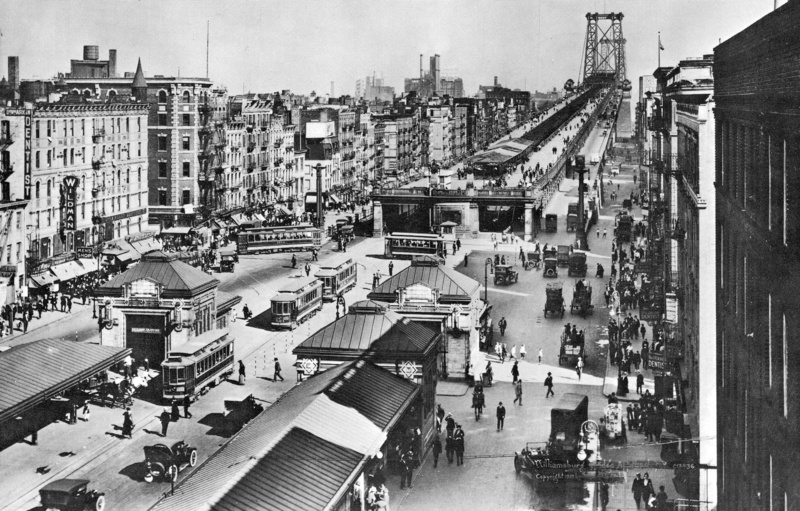 This 1919 photo of Delancey Street at the approach to the Williamsburg Bridge shows a messy stretch of tenements, shops, trolleys, and walkers crossing the bridge on foot. At the time, the bridge was a mere 16 years old. 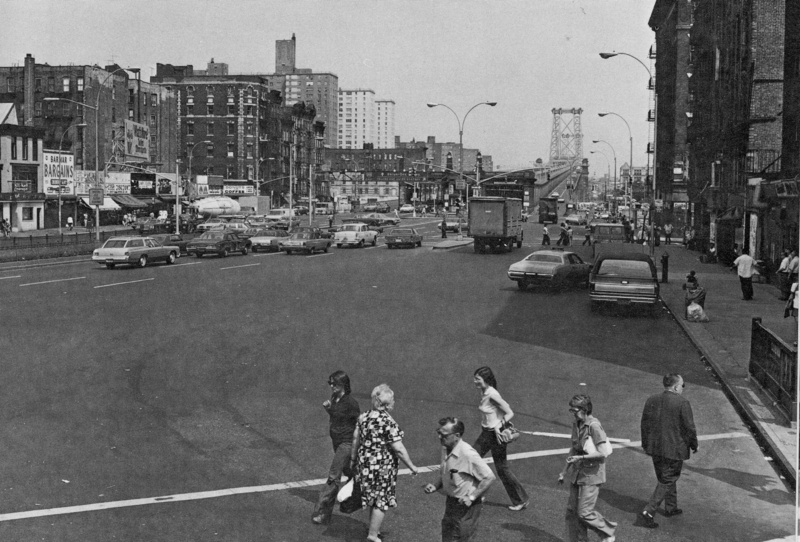 In 1975, the trolleys and subway stations are gone, as are the crowds. The approach still looks like a mess. Some of the tenements on the left at Clinton Street are still there, but many have been demolished and replaced by housing projects. Here’s the same stretch in 2010. 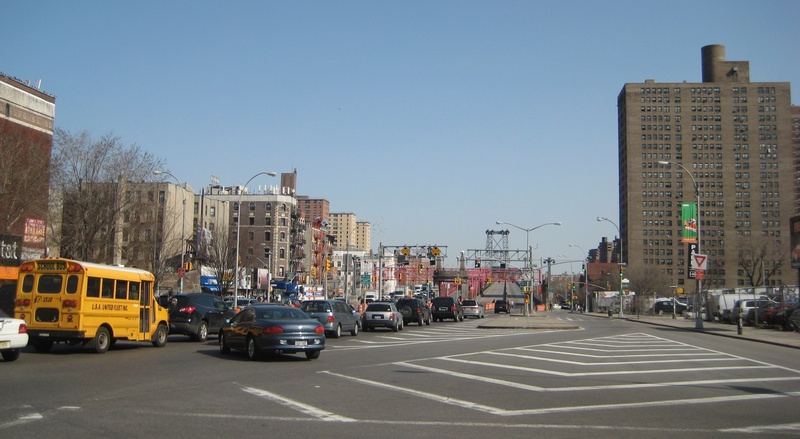 It’s still mostly a mess of cars, bargain stores, and a confusing juncture of streets. But that block of tenements on the left at Clinton Street is still hanging in there. The first two photos are from New York Then and Now. 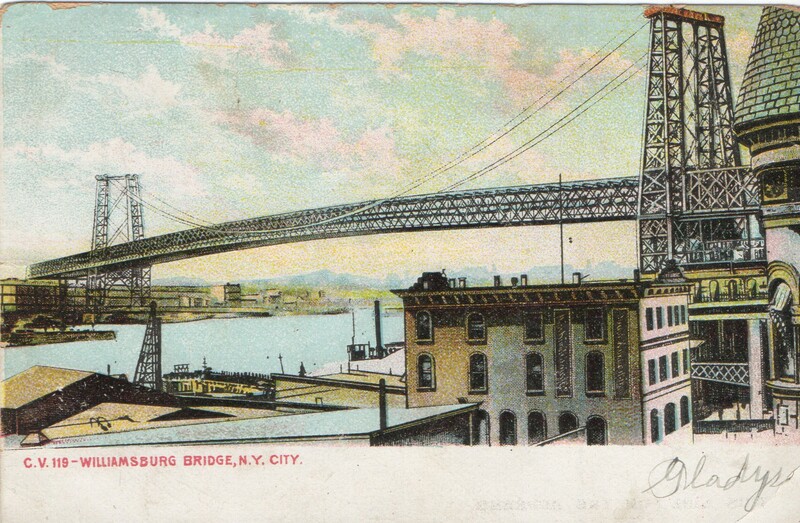 Opened in December 1903, the Williamsburg Bridge was the longest suspension bridge in the world (until 1924, that is). 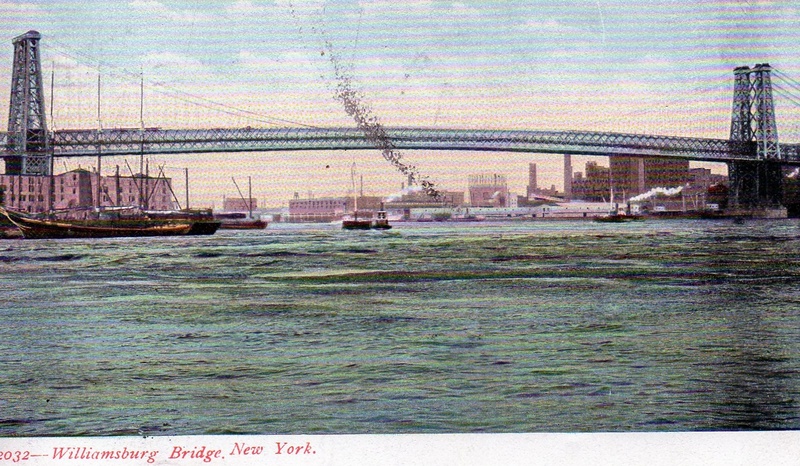 Here it is in a 1907 postcard, tinged with green and blue just like the sky above and the East River waters below it. Opening day of the bridge was filmed by Thomas Edison; it features officials in top hats, members of the press carrying big boxy cameras, a brass band, and lots of ribbons. Watch the clip here. 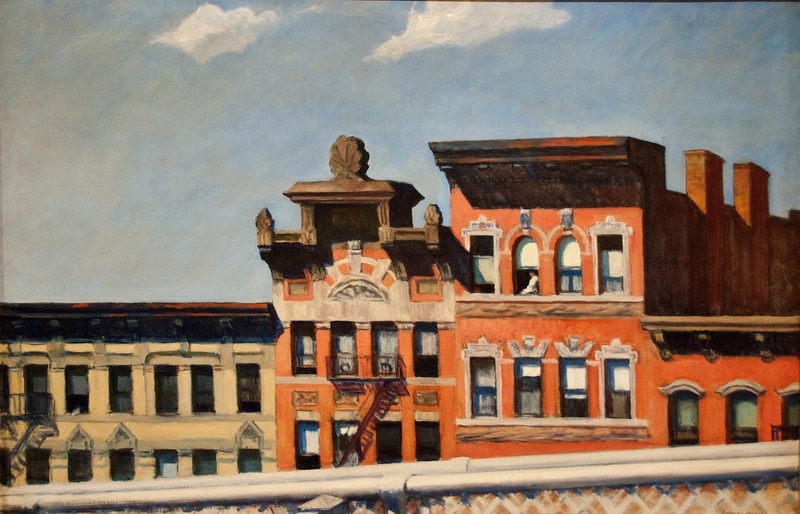 Fast-forward 45 years, and the bridge (as well as a lot of the old Lower East Side) is featured in the film noir The Naked City. Follow a police chase on foot and by car (and catch great glimpses of a subway on its way to Brooklyn) here. 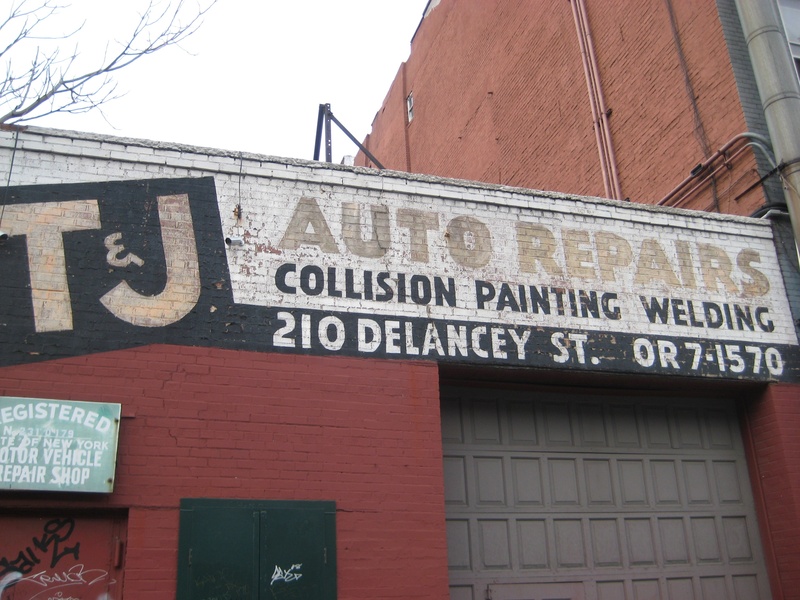 T & J Auto Repairs is on Delancey Street in the shadow of the Williamsburg Bridge. I love that they use the old OR phone exchange (for Orchard). 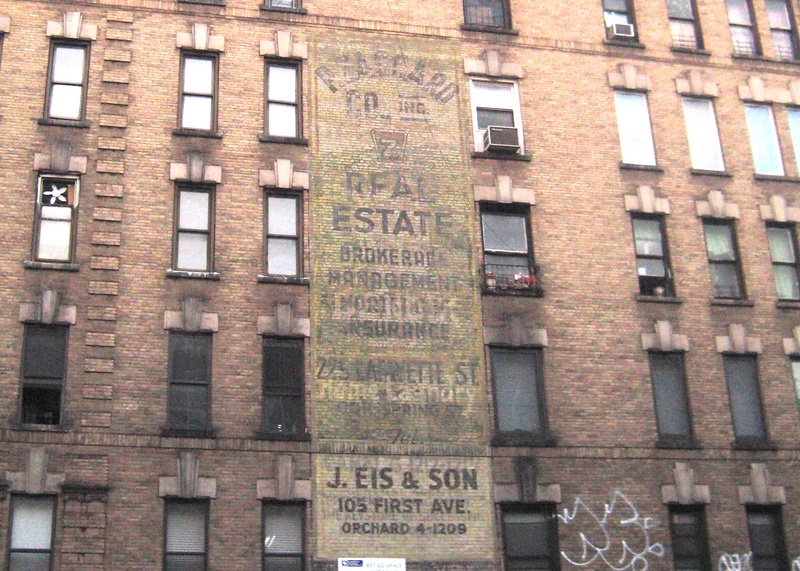 OR remains in a handful of other old signs and faded ads up to East 14th Street. The battered and weathered ad below is for two separate businesses. P. Zaccaro Real Estate was founded by Geraldine Ferraro’s father-in-law. J. Eis & Son sells (sold?) air conditioners. And at the very bottom, there’s the Orchard exchange again. 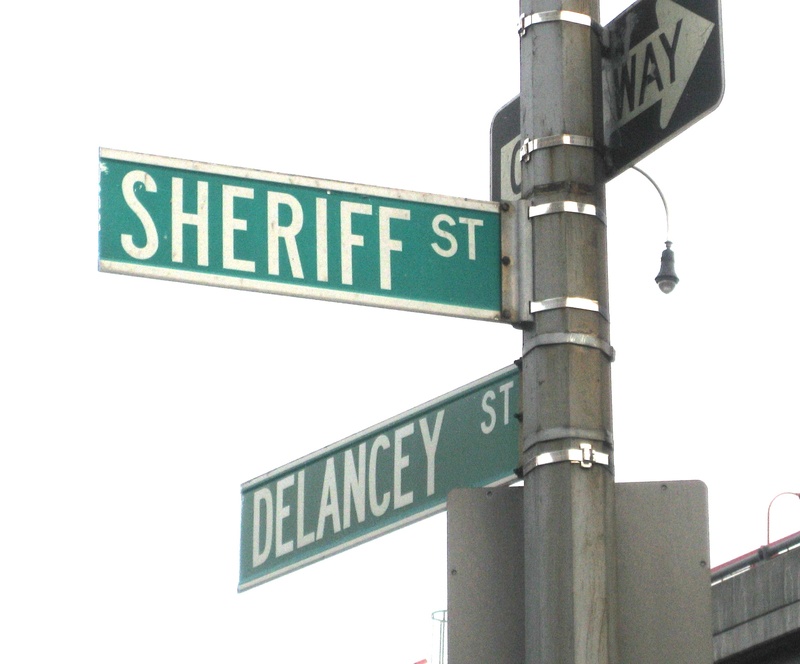 Sheriff Street used to run from Houston to Grand Streets on the Lower East Side. But then housing developments built in the 1940s obliterated it, and all that remains now is this lonely sign beside the Williamsburg Bridge. Not much distinguished Sheriff Street from other streets in the jam-packed immigrant neighborhood in the early part of the 20th century. 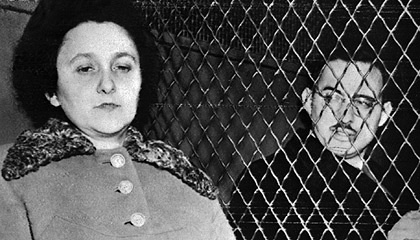 Except for one thing: Sheriff Street was the location of the childhood home of Ethel Rosenberg, executed with her husband Julius for espionage in 1953. “A synogogue and several small machine shops were also on the block. Taken together, these various enterprises gave Sheriff Street a distinctly commercial cast, although the many tenements housed hundreds of people above the din and tumult of the street,” Philipson writes.